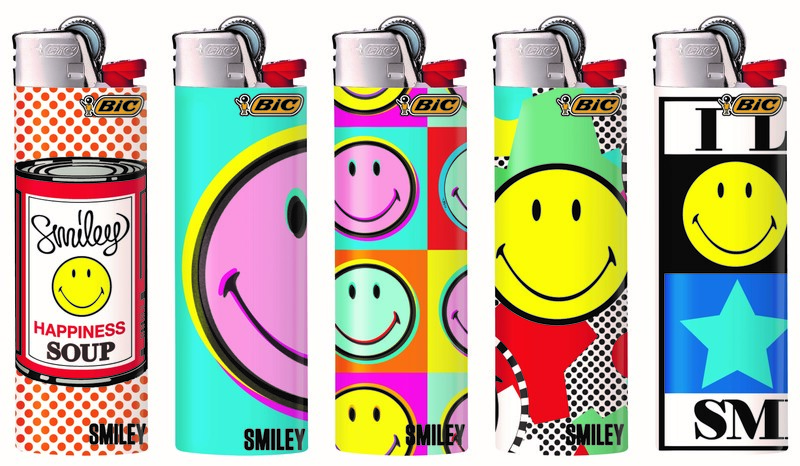 Smiley are pleased to announce a new licensing deal with FMCG company Bic, which will see the famous disposable Bic lighters adorned with different Smiley face images and slogans. Smiley are excited to announce that they will appear in the much anticipated video game, Just Dance 2015, Ubisoft’s latest installment of the world’s #1 dance game franchise. Happiness is a major global trend across all areas of fashion, technology and advertising at the moment, and this partnership brings all three together to elevate Smiley into the world of gaming. Just Dance 2015 was revealed yesterday at the Electronic Entertainment Expo (E3) in Los Angeles, the world’s premiere trade show for computer and video games, during the Ubisoft press conference. A trailer including gameplay footage of the song ‘Happy’ by Pharrell Williams was revealed, which features Smiley in the guise of its iconic yellow smiley face. Ubisoft’s creative team was inspired by the ‘Happy’ phenomenon while creating the Happy gameplay in Just Dance 2015, which is a tribute to this immensely popular song and movement. The choreography, design and colors of the ‘Happy’ gameplay immerse the players in a universe full of joy and happiness that will bring a big SMILE to every Just Dancer’s face while playing. Just Dance 2015 will be released in EMEA on October 23rd (October 24th in the UK) and in mid-October in the US on all motion control gaming platforms. SmileyWorld presents the new accessory collection that makes you ‘THINK POSITIVE’ . SmileyWorld have partnered with French lifestyle and accessory brand Incidence for a new collection inspired by the electronic and digital world. The concept of this collection uses the slogan ‘think positive’, and each piece has been created with happy and inspiring messages and motif’s. Wallets and tablet cases keep your personal items safe and happy when you are on the move, while mugs and alarm clocks inject positivity and quirkiness into your home. Bold monochrome with highlights of yellow feature on everything throughout the range, ensuring this collection stands out and makes a statement! 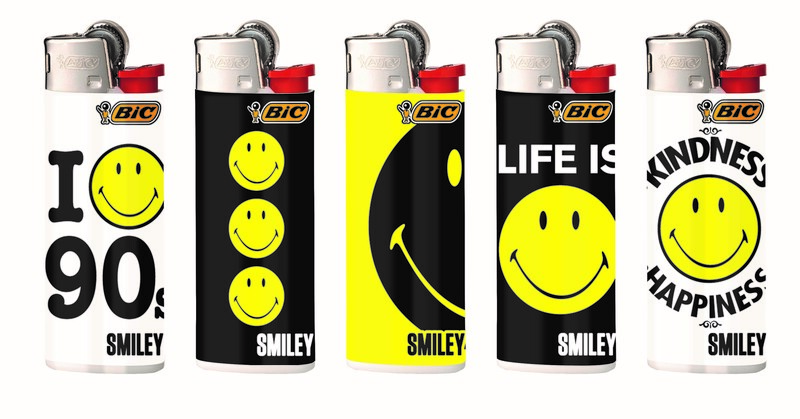 The whole Smiley by Incidence collection is available on the website now. Smiley and Etam welcome Spring Summer the sparkling way! Spring Summer’s back and Smiley and Etam are pleased to announce the retail launch of a new line of lounge and sleepwear. Smiley have joined forces with Etam this spring summer 2014 to launch a collaboration that will see the iconic Smiley face emblazoned on a collection of loungewear and nightwear exclusively for Etam. Smiles ’n’ stripes features; leisure shorts, pyjamas, tops and night dresses in luxurious cotton mixes, featuring sparkling Smiley embellishments with a dash of crystals. The entire range is an ode to to those lazy summers evenings, with light tones of grey melange, hues of aqua green and snow white ensuring you look and feel cool through those hot midsummers nights. SmileyWorld & Les Livres Du Dragon D’Or retail success! SmileyWorld is delighted to share news of another huge retail success. Following on from the success of their SmileyWorld stickers, Les Livres du Dragon d’Or (subsidiary of Editis Publishing) have created a collection of 6 sticker books, with themes such as; Peace and Love, Bad Attitude, Too Cute, Geek Style, Love, and Best Friends Forever. Each book has over 500 collectable stickers. This mini sticker book collaboration, available exclusively in France, surpassed sales of 15.000 units in just 2 months of its launch! SmileyWorld and Les Livres du Dragon d’Or have been collaborating since 2008 on a wide range of kids publications, such as diaries, calendars and sticker books. All of these products are available exclusively at smiley.com and Fnac.com websites.